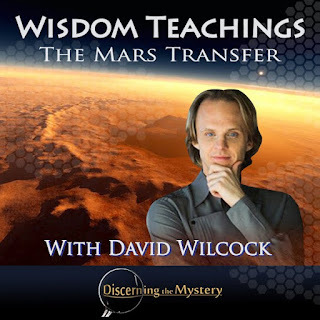 David continued to describe in greater detail the process of transferring the souls of the victims of the Martian catastrophe from Mars to Earth. This was a very interesting description, in my opinion, particularly because practical matters of energetic influence and pre-incarnation can be interesting topics to discuss. The discussion went on to describe this interplanetary transfer as a type of karmic balancing initiated by the Ra beings, and how the former Martian inhabitants were put into a type of soul depository. These souls were then transplanted to the Earth, genetically altered to suit Earth's conditions, and were gradually led away from their previous war-like ways toward a path of greater love, light, and unity. Wilcock went on to explain the correlation between the Law of One and the actual meaning behind many biblical accounts. He explained the significance behind the theme of the “harvest” depicted in the Gospel of Matthew as well as many details from the Old Testament and the history of these references. According to the discussion, the harvest analogy represents a point in the evolutionary development of a planet in which the sentient beings on that planet are sorted in such a way that the characteristics of violence, fear, selfishness, materialism, greed, and other destructive tendencies are “plucked off” or removed. At the same time, the positively oriented souls are assisted in their development on the benevolent path. In short, the people are sorted so that every soul is transported to where they needed to go in order to successfully continue their evolutionary progress. One point that caught my attention was about the progress of a soul through each density. As David put it, the goal of this present life on Earth is to graduate from 3rd density to 4th density--at which point a soul learns what the Law of One terms the “Law of Love.” As the soul progresses even farther, they are given the opportunity to learn the Law of Light which comes at 5th density and includes lessons of wisdom and communication. David goes on to describe the rest of these chakra, as well as their corresponding steps along the path of ascension. For more information about the human chakra system, click the links below. The information that David shared about the chakra system was actually familiar to me in a number of ways. These details were based upon ancient knowledge of human physiology, kinesiology, and energetics--subjects I have studied extensively in the past. It was also intriguing to hear more on the process of incarnation. This particular subject reminded me of my childhood quite a bit. As a young child, there were times at which I had faint memories of what I can only describe as perfect unity consciousness. At certain points, in my mind's eye, I could see colors, feel energies, and I could have sworn there was an audible harmony along with a feeling of being home. I cannot say what exactly this experience was, but in my recent meditations, I find myself revisiting this energetic state quite often. Anyway, it was good to be reminded of that place. Overall, this episode left me eager for the next one. I honestly wish these discussions were longer than a half hour, but I realize how much work even writing one episode must be, let alone writing and delivering several at a time. I appreciate David's work, and look forward to next week. Click here to watch this week's episode, “Wisdom Teachings – The Mars Transfer”.